Suing former clients to recover a contingent fee is never ideal. But neither is working for free. Like any other contract for services, when an attorney enters into a contingent fee agreement with a client, the attorney expects she will be paid for her services if her client recovers. What if the attorney, though, has worked on her client’s case for some time and the client terminates the attorney-client relationship before the client recovers? And, what if the client hires another attorney and the new attorney helps the client settle the case? Does the former attorney have a remedy against the client’s new counsel or the third-party with whom the former client settled? 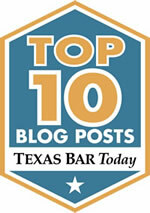 The Beaumont Court of Appeals recently issued an opinion which touches on the questions and issues raised above. In Effrem D. Sewell v. Zurich American Insurance Company, Case Number 09-16-00079-CV, the court of appeals affirmed the trial court’s summary judgment in favor of Zurich as to Sewell’s breach of contract and quantum meriut causes of action. Zurich insured a vehicle operated by an employee of Diakon Logistics. The employee was involved in a vehicular accident with a motorcycle operated by Joseph Guillory, II. Guillory hired Sewell as an attorney to represent him in pursuing claims against Diakon Logistics for injuries Guillory sustained as a result of the accident. The representation agreement between Sewell and Guillory contained a standard contingent fee agreement. Sewell immediately sent a letter to Zurich, advising Zurich that he represented Guillory in his claim against Diakon Logistics and informing Zurich that he had been assigned an undivided interest in Guillory’s claims and causes of action. About eight months after the representation agreement was signed, Guillory terminated Sewell. Guillory secured new counsel. Seventeen months later, Guillory entered into a settlement agreement, acknowledged and approved by his new counsel. Zurich paid the agreed-to settlement value to Guillory and his new counsel. Sewell brought suit against his former client (Guillory) and against Zurich for breach of contract and in quantum meruit. Sewell did not sue Diakon Logistics. Zurich filed a traditional motion for summary judgment, arguing that Zurich owed no duty to Sewell, that Zurich had no contractual relationship with Sewell, and that Sewell’s remedy, if any, would be an action against his former client. The trial court granted Zurich’s motion. In its opinion affirming the trial court’s summary judgment in favor of Zurich, the Beaumont Court of Appeals reaffirmed the general rule that terminated counsel may not seek to recover his contingency fee against the opposing party or its insurer. See e.g., Dow Chemical Co. v. Benton, 357 S.W.2d 565, 568 (Tex. 1962) (reasoning that a “lawyer’s rights, based on the contingent fee contract, are wholly derivative from those of his client” and that an attorney working on a contingent fee “elects to litigate his interest simultaneously with his client’s interest [and] in his client’s name); Honeycutt v. Billingsley, 992 S.W.2d 570, 584 (Tex. App.—Houston [1st Dist.] 1999, no pet.). The court noted an exception to the general rule—when the discharged attorney pleads and proves that his former client and the opposing party conspired to vitiate terminated counsel’s contractual rights. Sewell, however, did not plead or argue that Guillory conspired with Zurich to deprive Sewell of any rights under the contingent fee agreement. The Sewell opinion should bring some clarity and consistency to contingent fee recovery practice. A discharged attorney hired on a contingent-fee basis can seek recovery of his fee against his former client in a breach of contract action or in quantum meruit—the Mandell remedies. See Mandell & Wright v. Thomas, 441 S.W.2d 841, 847 (Tex. 1969). If terminated counsel wishes to pursue his contingent fee against the opposing party or its insurance carrier, terminated counsel will need to plead and prove an exception to the general rule which limits terminated counsel to the Mandell remedies solely against his former client.